Rugby players always remember where they have collected their wounds and they never forget who inflicted them either. Ireland captain Rory Best's right eye is hooded by swelling, blood still seeping from the latest scar to be visited upon him on a night when he has become his province's most capped European club player, in a second successive win. Friendly fire, Rory? "Definitely not." Asked if he has any idea when his eye was transformed into something resembling an over-boiled radish, his answer is swift and prompt. He was ready to take any hits that were necessary, as long as the fight was won against the Scarlets. "Yeah. The first, maybe second ruck. We knew they would come out really hard at the start. It was Jake Ball. "That was the other thing. We knew he would come in. He's a big, physical player. "I went in for a poach. He politely reminded me their ruck ball is their ruck ball. Ach, it looks worse than it is." Too many times, Best has emerged from the fight with the battle lost. This year may be different. His own mental scars of European despair - four successive seasons of supine elimination at the pool stages - are almost as ghoulish as the claret-spilling mess upon his face. "After putting ourselves in a strong position, it would be very special for this group to go through," says the veteran, whose 72nd appearance in Europe surpassed Andrew Trimble's record for the province. "After all we have been through over the last 12 to 18 months, just to take a step up is so important. That is where we want to get. "You can see we are enjoying our rugby, we are trying to play with the pace, with the width. "I think that every person out there, especially in the last two weeks, looked like they wanted to have the ball in their hand and when they do not, they want to go and defend for each other. "The coaches have been drilling it for a while now. Sometimes it just takes it to click. We are far from the finished article, but I think there is a real want to be better. "Ulster teams in the past, never mind beating Scarlets away, we would have lost that game for a start. "But to go there and produce a good performance and get four or five points, even in the past we would have then rocked up the next week and taken it for granted. "I was involved in that Northampton back-to-back, where we bonus-pointed at Franklin's Gardens and then lost here. But this team wants to get better. Last year, we were in a similar position in Europe, but I think the manner in which we were getting there, we were a bit start-stop, a bit moment-of-genius play and moment-of-fairly-average play. "I think we have a little bit more consistency now, but we will not get carried away. "Sometimes it is going to be steps forward and a step back somewhere along the line because a lot of these guys are young." That zest within an emerging group, as if untainted by perennial failures, has helped to infuse the 36-year-old with renewed vigour. "I am reasonably happy with how I have been playing all year, I am enjoying it. It is nice getting out there and nice being a part of a pack that want to be physical and want to take teams on and something I have always tried to do. 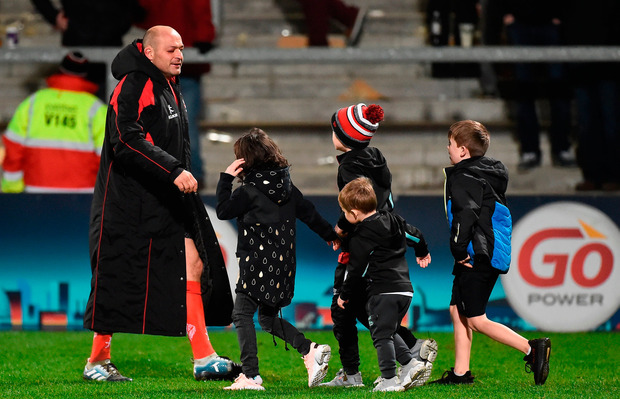 "Sometimes it doesn't always happen, but you try to enjoy your rugby and get stuck in and be as good as you can be yourself, but also try to affect people around you and make them better if you can. "When you have guys like Marty Moore, he is a wee bit different because he is experienced, but guys like Eric O'Sullivan beside you, you can just see everything you say to him he takes in. "He wants to try and implement it and it is really refreshing and it has given me a lease of life. "I don't like to talk too much about my game, but it's just nice to be amongst people who want to get better." Too often, he has shouldered the leadership burden alone, but with a pack no longer being shoved around with impunity, at this rate his post-World Cup plans may not necessarily be re-directed towards a Banbridge farm. "Last year, and even the start of this year a bit, we were getting pushed off scrums, we were getting mauled over and conceding tries. "You felt like you were going to concede a try every time you played in the maul and we've put a stop to that. "The boys have stood up and said, 'look, we're being told where to be'. But that's not enough. You've got to know where to be and you've got to bring an edge to it. "I'll take it as it comes. I am enjoying my rugby and at the minute I'm focusing on getting past this Christmas period with Ulster. "Then we have a couple of big European games and, before you know it, it's the Six Nations again. "My focus is very much on getting myself in the best position I can be to get out of this group, to play in a quarter-final, try and retain a Six Nations title and go to a World Cup. Beyond that, we'll just have to see how we're going. "I don't feel like I'm any different to 12 months ago or 24 months ago. Maybe a lot of it's in the head and a lot of stubbornness has gone a long way in this case!"